Here is the Weekly Summary and a look ahead (Housing, Bernanke testimony, Euro stress tests all coming up). In order to keep the Really Bad scenario from becoming massively long, it’s in several pieces. This one is only on sovereign defaults. There will be more on swaps and banking later in the week. How likely or unlikely is the “Really Bad” scenario? The author has built a number of risk simulation models for various purposes. Choosing scenarios or simulation outputs which show things going really badly involves some tradeoffs. There is always that small probability of Earth being hit by a huge asteroid resulting in mass extinction. I usually leave such events out of my models. Wars and disease are tough items to model, but government financial problems are often related. More on those in Part 6. There is a strong tendency among people who are not researchers or modelers to think a particular bad scenario can’t or won’t occur. If you want to get attention from management or regulators and motivate them to do something, one effective technique is to show what would happen if something very similar to prior history repeated itself. When they say “there’s no way that many sovereigns could default at once”, you pull out the numbers and show them that it’s actually occurred several times in the past. People who don’t do statistics are usually drawn to individual stories or scenarios. I look for scenarios which are informative about risks that might be mitigated in some way. It’s frustrating for everyone involved if they believe what you are presenting, but then can’t do anything about the risks or other problems. So, out of the multitude of potential scenarios, I have settled upon one which is really bad, but doesn’t involve asteroids, mass extinctions, or apes taking over. It is consistent with prior bad episodes of sovereign debt default. Here is the Really Bad scenario. It’s not a worst possible scenario. It is more like the Long Depression or the Great Depression reoccurring under 2010 conditions. In the Really Bad scenario, 45% of the countries with large outstanding sovereign debts are in default within a 2-3 year period. As we saw in Part 2B, levels between 40% and 50% of sovereigns in default have been reached five times in the last two centuries, (1830s, 1840s, 1880s, 1930s, 1940s, source: Eight Centuries of Financial Crises, page 4). So, who defaults? A simple method is to choose the 45% of countries with large sovereign debts (over $50 billion) that currently have the highest cumulative probability of default. They are assumed to default in the same order as implied by their cumulative probability of default at 6/30/10 from CMA: Greece, Argentina (again), Portugal, Ireland, Spain, Italy, Turkey, Indonesia, Belgium, South Africa, Thailand, South Korea, Poland, Brazil, Mexico and Malaysia. This involves about $5.6 trillion of debt in default, about 16% of all sovereign debt. If historic trends repeat themselves, it all happens within about two years of the first default (Greece), and 11 home currencies are involved. At the low end recovery rate of 31% of face value, there are about $3.8 trillion of losses. This is about 2-3 times the amount currently embodied in credit default swap pricing which we calculated in Part 4 ($1.3-1.8 trillion). But then, since this is a really bad scenario, Japan defaults too. This might occur because of a global economic slowdown, a rise in general risk premiums and interest rates raising Japan’s debt service (this could take longer, Japan’s average maturity is 5-6 years), Japan’s banking system being affected by defaults elsewhere in the world, lack of political will to make reforms, or several other mechanisms. For those of you who say Japan’s default is an incredibly unlikely event, note the following. Many officials have a long term concern about Japan. If there are many other sovereign defaults, the time frame could speed up considerably. 1. Prime Minister Naoto Kan said “We cannot sustain public finance that overly relies on issuing bonds," Kan told parliament in his first policy speech. As we can see in the euro zone confusion that started from Greece, there is a risk of default if the growing public debt is neglected and if trust is lost in the bond market." 2. In the last year, the price of Japanese CDS have tripled. CMAVision estimates a 5 year probability of default of 8.3% from their CDS prices at June 30, 2010. 5. The IMF modeled the effect of sovereign defaults elsewhere on Japan. They found “Sovereign debt crisis and increased risk premium. Assessing the macroeconomic implications of a sharp rise in government bond yields, this scenario assumes an increase in the risk premium by 100 basis points for the U.S. and 200 basis points for the euro area without offsetting fiscal policy. If the risk premium in Japan remains unaffected, growth would slow through the export and exchange rate channel by between 0.5 to 1 percentage points in 2010. If, on the other hand, the risk premium in Japan also increases (by 100 basis points), growth could fall by as much as 2 percentage points. Given depressed demand, deflation would worsen by about 0.5to 1 percentage point below the baseline in 2011.” (source: IMF, Japan Staff Report for the 2010 Article IV Consultation, June 2010). Japan has over a quarter of all sovereign debt outstanding worldwide. It’s default would be bigger than all of the others in this scenario combined. In our Really Bad scenario, another $9.7 trillion in sovereign debt goes into default. The total debt in default reaches $15.3 trillion, and almost half of all outstanding sovereign debt is in default. The losses are $10.5 trillion at the low end recovery rate of 31%. 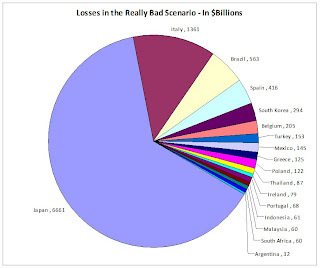 At the low end, losses are $7.5 trillion (50% of face value). Of course, recoveries in some countries will be higher than others, but you get the general idea. Next up: Part 5B. What Happens If Things Go Really Badly? More Things Can Go Badly: Credit Default Swaps, Interest Swaps and Options, Foreign Exchange. Disclosure on Some Investor Guy: Based in the US, I currently own no foreign sovereigns. I do own some foreign bank bonds. Unless cited to another source, all research and opinions are my own, and could differ from just about anyone, potentially including: the firm I work for, regulators, politicians, the bond market, the CDS market, academics, doomers, polyannas, and people who are trying to sell you something. Nothing in the series is legal or investment advice, nor advice to buy or sell investments, concrete, remote doomsteads, or canned goods. Renting copies of Mad Max videos may be entertaining, however science fiction movies are no indication of future real world performance.